Product prices and availability are accurate as of 2019-04-24 18:44:30 EDT and are subject to change. Any price and availability information displayed on http://www.amazon.com/ at the time of purchase will apply to the purchase of this product. Oxygenating your wort prior to pitching the yeast is a vital step in the brewing process that many brewers do not pay much attention to. Ideally your wort would have an oxygen level of 8 PPM (parts per million) however most brewers only achieve 2.5-4.5 PPM without using an aeration system. Using this wort aeration system you can easily achieve much higher oxygen levels by injecting pure o2! 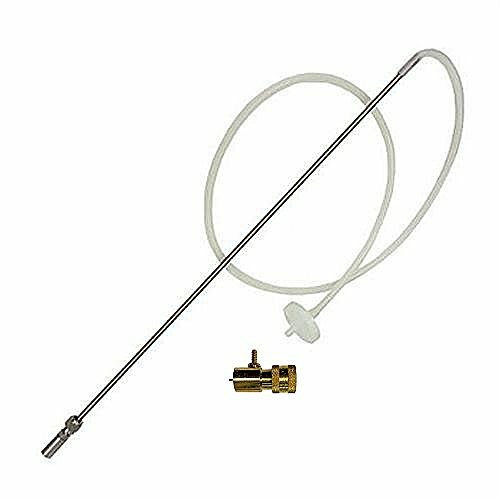 Regulator attaches directly to a disposable oxygen tank-NOT INCLUDED(available at most hardware stores) Using a wort aeration system will not only be far more safe than shaking your carboy around but will also contribute to lower final gravities, quicker fermentation, and a cleaner fermentation. Cleaning your aeration system is as easy as putting your air tubing and oxygen diffusion stone in your sanitized solution. Be sure to never handle the diffusion stone with your bare hands as natural skin oils can clog the stone's pores. This deluxe kit comes with a 22" long stainless aeration wand with stone, air/02 filter, 4ft of silicone tubing, and a brass valve/regulator to attach to your disposable oxygen tank.